This was a fourteen-night cruise from Amsterdam to Vlissengen (Flushing), Antwerp, Brest, La Rochelle, Bordeaux, Santander, Lisbon, Gibraltar and Barcelona. This ship was built in 1988 as the Royal Viking Sun for Royal Viking Line. The Royal Viking Sun was sold to the Cunard Line in 1994 and initially kept its original name. However, in 1999 it was transferred to another Carnival Corporation subsidiary, Seabourn Cruise Line as the Seabourn Sun. In 2002, it was further transferred to Holland America Line, when it received its present name. The Prinsendam is 669 feet long and has a gross tonnage of 38,100. It accommodates 835 passengers and has a crew of 499. The ship is registered in Rotterdam. Although it is a small ship by modern day standards, it looks like a big ship from the waterline and from the vantage points on Decks 12 and 13. Our stateroom was a standard two-person ocean view cabin. We had a small walk-in closet, which could accommodate only one of us at a time. Two robes and an umbrella were provided for our use. Although many cabins on the ship had full bathtubs, our bathroom only had a shower. We had a love seat which could be converted into a third berth. The door to the bathroom was a sliding door, which closed at one end, but was slightly open at the other end. There was a floor to ceiling mirror between the bathroom door and the door to the walk-in closet. There was another mirror over the desk. A corner cabinet contained a television and a refrigerator. The stateroom had a large rectangular window. There was a one-foot wide sill between the window and the inner wall of the cabin. This space was closed off by another window which was approximately five feet across by four feet high. It was attached on the right by a piano hinge and on the left by a lock. We had never seen such an interior window before and inquired why it was there. We were told that it was to decrease noise from outside the cabin. We asked the steward if it could be removed and he summoned an engineering officer. The officer said that it would be difficult to remove the window, but he unlocked it so that we could open it at any time. 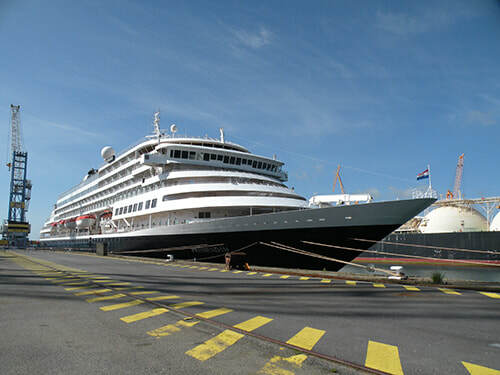 The Prinsendam has a wraparound teak promenade deck on Deck 7, Lower Promenade Deck. Four circuits equal one mile. There are padded deck chairs along both sides of this deck. In addition, at the stern, there are several rows of deck chairs which are covered by the overhang of Deck 8, the Promenade Deck. At the forward end of the Lower Promenade Deck is a stairway leading up to an observation platform on Deck 8 and there is another stairway from Deck 8 to a second observation platform on Deck 9, Upper Promenade Deck. For those in the suites on Deck 10, Verandah Deck, there is a private observation platform just below the bridge. There is yet another forward observation platform on Deck 13, Observation Deck. 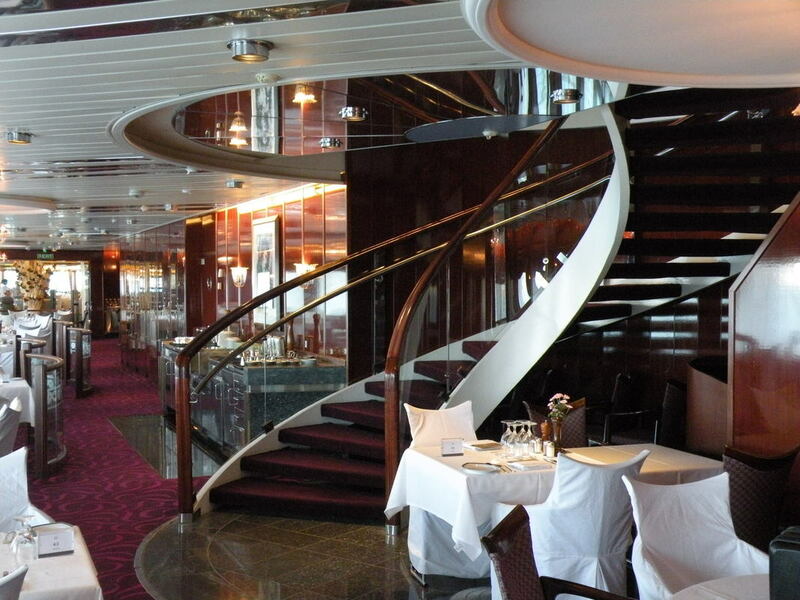 The main restaurant, La Fontaine Dining Room, is located aft on Deck 7. It looks out over the Lower Promenade Deck on three sides. A second part of the La Fontaine Dining Room is located forward of the main restaurant on the starboard side. We were told that this restaurant was for fixed seating diners, while the main restaurant was for open seating diners. However, there were many fixed seating diners assigned to the main dining room. My impression was that the forward part of the La Fontaine Dining Room served as the equivalent of the Odyssey Restaurant on the SS Rotterdam of 1959 and was reserved for passengers in the suites. We found the food and service in the La Fontaine Dining Room very good, although we sensed that the integration of the fixed seating passengers and the open seating diners presented a challenge to the wait staff. Forward of the dining room on the starboard side of Deck 7 is the Ocean Bar, which opened onto the Atrium at the forward end. In this room, the Ocean Quartet played rock and roll hits. On the port side of Deck 7, just aft of the Atrium, is the Pinnacle Restaurant. This room is visually stunning, with many impressionist paintings adorning the red walls. There is an extra charge of $35 for this restaurant on most nights. On two nights the room was converted into Le Cirque, with a special menu for an extra charge was $49. On Deck 8, the aft most room on the starboard side is the Explorer’s Lounge. This room has a circular staircase leading down to the forward part of the La Fontaine Dining Room on Deck 7. A pianist and a violin player played classical music on most nights. Opposite to the Explorer’s Lounge on the port side of Deck 8 is the Casino. As you head forward from the casino you will find the small Java Bar and Café, which has a large screen television showing sporting events. From the Java Bar and Café, you can walk into the Oak Room, with book cases, easy chairs and a fireplace. The fireplace was not in use. Forward of the Oak Room on the port side of Deck 8 is Explorations Café, which has a well-stocked library and computers. Any refreshments have to be obtained from the Java Bar and Café. A small gift shop is located on the port side of Deck 8, just aft of the Atrium. The purser’s desk, called Guest Services, is along the aft wall of the Atrium. Here each day you could get printed copies of the Time’s Digest (with different versions for America, England and Germany) and crossword puzzles. At the forward end of Deck 8 is the Showroom at Sea. The entertainment provided in this room is similar to what is provided on the larger Holland America Line ships, although on a smaller scale in some instances. A unique feature of this ship is the two launderettes, one on Deck 6 and one on Deck 10, which are free of charge. Another specialty restaurant, Canaletto, is on Deck 11, Lido Deck, aft of the Lido Market. There is a charge of $15 for this restaurant. There are two pools on the ship. One is on the aft end of Deck 9, Upper Promenade Deck. The other is located midship on Deck 11, Lido Deck. There was no water in the pool on Deck 9 during our cruise, but the two adjacent hot tubs were in use. The pool on Deck 11 was heated and did see limited use. This pool is fairly small. It reminded me of the midship pool on the original Pacific Princess. At the forward end of Deck 12, Sports Deck, is the Crow’s Nest. This lounge overlooks the bow and, because it is located above the bridge, does not have curtains drawn over the windows at night. A piano player provide entertainment in this room during the evenings. During the day, it was a wonderful place to read a book or just sit and watch the sea. There are only two stairwells on the ship, one by the Atrium and one by La Fontaine Dining Room, and each has two elevators. Of interest to ocean liner enthusiasts, the aft stairwell has several oil paintings of Holland America Line ships by Stephen Card. For instance, there is a painting of the prior Prinsendam, which entered service in 1973, on the landing between Decks 6 and 7. There is also a model of the prior Prinsendam in a case in the lobby of the aft stairwell near the entrance to the Explorer’s Lounge on Deck 8. There is a larger model of the Royal Viking Sun in a case on the lobby of the forward stairwell on Deck 11. After our late afternoon departure from Amsterdam, we sailed overnight to Vlissingen. Upon arrival in Vlissingen, we took a motor coach to Middelburg, where we had a walking tour of the city. Middelburg was the second headquarters of the Dutch East India Company. The restored City Hall is an impressive example of post-Renaissance architecture. We left Vlissingen in early afternoon and sailed up the Schelde River to Antwerp, where we docked in the center of town later that day. Many passengers headed out to explore the city that evening, but we decided to get an early start the next morning. Our first place to visit was the Red Star Line Museum located near the banks of the Schelde about a half a mile from the ship. This museum has an observation tower with good views over the river and the city. We then took a bus to the Central Station, an architectural tour-de-force dating from 1905. From here, we walked slowly back to the ship with brief stops at Rubens House, dating from the early 1600s, and Our Lady’s Cathedral, dating from the 1350s. We sailed from Antwerp in late afternoon and spent a day at sea on our way to Brest in France. There were some mild swells during this part of the journey which caused the ship to pitch and occasionally experience a modest roll. The ship handled the sea very well and we were surprised to hear some passengers moan about the rough seas. All I could think of was that they had not seen anything near rough. We arrived in Brest early the next morning. Here we opted to take a tour to the town of Morlaix and the Chateau de Kerjean. Morlaix is noted for a colossal viaduct, dating to Roman times, that traverses the city. Of further interest, however, is a bar/restaurant named SS Norway, with a stylized picture of the bow of the ship as part of its sign. From Morlaix, we were driven to the Chateau de Kerjean. The large stone chateau dates from 1550 and many of the rooms contain furniture that is several hundred years old. The kitchen looks just as it may have centuries ago. After a late afternoon departure from Brest, we sailed to La Rochelle, where we docked at 10:00 AM. The port of La Rochelle has two distinctive medieval towers on each side of the entrance to the harbor. In this port, we decided to take to a tour to the town of Saintes and La Roche-Courbon Castle. In Saintes, we saw the restored Roman Arch of Germanicus and the Cathedral of St. Pierre. We did not see the Roman amphitheater. From Saintes, we were driven to La Roche-Courbon Castle. This castle was originally built in 1475 and has been updated and modernized through the years. The current owners still reside there, so the second floor was not included in the tour. The first floor contains many traces of the original decoration. There is evidence of a moat that once surrounded the castle. A pleasant outdoor café near the gate of the castle offers pastries, ice cream and wine. A small souvenir shop is in the gate house. We left La Rochelle at 8:00 PM and sailed overnight to Bordeaux, where we docked at 10:00 AM. The late morning arrival allowed the passengers to be on deck as we sailed up the Garonne River and under the Pont d’Aquitaine, a large suspension bridge, and the Pont Jacques Chaban-Delmas, reportedly the largest lift bridge in Europe. The 361-foot center span of this bridge can be raised 174 feet to let ships pass under. We docked near the picturesque Place de la Bourse. We decided to explore the city on foot and by tram, for which we bought a twenty-four-hour pass. We visited the Cathedrale Saint Andre and its freestanding bell tower, Tour Pey-Berland. The cathedral was unique in that it has an entrance on the side of the long nave, rather that at one end. We next went to the Musee des Beaux Arts and viewed the art works in both wings. We also saw the opera house, the Grand Theatre, and the nearby Monument aux Girondins, a tall column with a statue of “Liberty Breaking Its Chains” on the top. There are several medieval defensive gate towers still standing in the city and we saw Porte Cailhau and Grosse Cloche, which, as its name suggests, has a large clock. On our second day in Bordeaux, the latest Peace Boat, Ocean Dream, docked just astern. This ship had originally been Carnival Cruise Line’s first newbuild, the Tropicale, which entered service in 1981. In late morning, we sailed back down the Garonne on our way to Santander in Spain. When we reached Santander, we took a tour to Bilbao to see the Guggenheim Museum designed by Frank Gehry. This architectural marvel contains several galleries for temporary art exhibitions. The museum has a very limited permanent collection of art, among which are eight large steel pieces by Richard Serra in the museum’s largest gallery. The museum is noted for its soaring steel and stone interior and its titanium clad exterior, which was designed to represent fish scales. After departing from Santander, we had a day at sea before a two-day stop in Lisbon. We docked at a new port facility in the Alfama district. On our first day in Lisbon, we were joined by the Celebrity Eclipse and the Costa Mediterranea. We decided to visit Sintra. We took a taxi to the Rossio Station and boarded a train to Sintra. In Sintra we took a bus to the Pena Palace on a hill overlooking the town. We toured the palace and then walked to the remains of the Moorish Castle on an adjoining hill. On our bus ride back to town, we got off in the historic center for a tour of the National Palace of Sintra. A short bus ride brought us back to the train station. We interrupted our return to Lisbon with a stop in Queluz to visit the 18th century Palace of Queluz. On our second day in Lisbon the Navigator of the Seas docked astern. After a late breakfast, we visited the Se Cathedral and a portion of the Castle of Saint George. 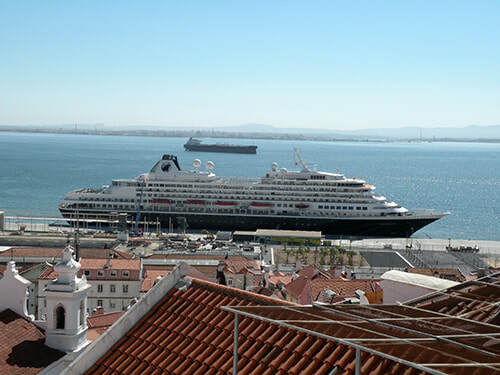 The Prinsendam sailed from Lisbon in mid-afternoon. We passed under the suspension bridge, Ponte 25 de Abril, and saw the Belem Tower on way down the Tagus River to the sea. We enjoyed another day at sea before we reached Gibraltar. Across the dock from us was the Noble Caledonia ship, Island Sky, which had originally entered service as the Renaissance Eight in 1992. We opted to stroll through Casemates Square and Main Street on our way to visit the Botanic Gardens, near the entrance to the cable car up to the top of the Rock of Gibraltar. ​We had a final day at sea before we arrived in Barcelona, where we disembarked. The Freedom of the Seas was docked in front of the Prinsendam. As we left the port on the bus to the airport, we saw Thompson Celebration, formerly Holland America Line’s Noordam of 1984, preparing to dock. Above: La Fontaine Dining Room. Below: Prinsendam in Lisbon. (Photos courtesy of D. Hume).